It’s a classic in network theory. 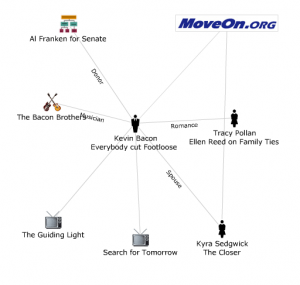 The Oracle of Bacon illustrates the small world phenomenon by showing how each actor or actress within six steps is connected to Kevin Bacon. Now the Notable Names Database does something similar for all people (well, mostly American people) who have ever been noteworthy in one way or the other. The NNDB Mapper visualizes the connections between over 37,000 more or less famous people (via).